Area Sports Menu for Sunday, September 16 Sept. 15, 2018, 10:10 p.m.
Dear Annie: Suspicious Snoop Sept. 15, 2018, 1:35 p.m.
NASA satellite launched to measure Earth’s ice changes Sept. 15, 2018, 11:30 a.m. Ask the doctors: Boys’ intense video game interaction worries grandparents Sept. 15, 2018, 10:20 a.m. Grip on Sports: Let’s just say goodbye to summer a bit early Sept. 15, 2018, 8:48 a.m.
College soccer: Whitworth women open Northwest Conference play with shutout win Sept. 15, 2018, 8:20 p.m.
College cross country: Whitworth women win Pacific Lutheran Invitational Sept. 15, 2018, 6:53 p.m.
College volleyball: Idaho wraps up nonconference play with win at Cal State Fullerton tournament Sept. 15, 2018, 6:09 p.m.
Gonzaga volleyball drops final match at Arizona State’s Sparky Classic Sept. 15, 2018, 5:25 p.m. Locally: Idaho swim and dive team raises more than $11,000 for cancer research Sept. 15, 2018, 3:33 p.m.
Springhill Suites hotel planned near Spokane Airport Sept. 15, 2018, 6 a.m.
Apparel company The Great PNW to move to larger quarters Sept. 15, 2018, 3 a.m.
Man facing battery of charges after stealing van, kidnapping passenger Sept. 15, 2018, 4:36 p.m.
Eastern Washington notebook: Second-half momentum killed on a holding penalty in loss to Washington State Sept. 15, 2018, 11:33 p.m.  Teens in Spokane County are vaping more, while smoking and drinking less Sept. 15, 2018, 5 a.m.
Cross country roundup: Pullman’s Roman Romanyuk wins Seaport Invite Sept. 15, 2018, 7:34 p.m. Girls soccer roundup: Lydia Myers bags two goals, Gonzaga Prep beats West Valley Sept. 15, 2018, 7:11 p.m. Morning prep football roundup: Greater Spokane League kicks off league schedule with three games Sept. 15, 2018, 6 a.m. Ask the Builder: Retaining wall basics Sept. 15, 2018, 4:30 p.m. In the Garden: Artist’s colorful landscape designed to age gracefully Sept. 15, 2018, 10 a.m. Proposed Lochsa River designation loses ground Sept. 15, 2018, 1:25 p.m.
Canelo Alvarez wins narrow decision for middleweight title Sept. 15, 2018, 9:28 p.m.
MLB capsules: Cleveland Indians blank Detroit, clinch third straight A.L. Central title Sept. 15, 2018, 10:24 p.m.
Cinch of a clinch: Cleveland Indians win third straight division title Sept. 15, 2018, 9:09 p.m.
Pac-12 roundup: Sam Ehlinger’s 2 touchdown passes lead Texas over No. 22 USC 37-14 Sept. 15, 2018, 9:43 p.m.
Big Sky roundup: Freshman quarterback Tucker Rovig leads Montana State over Wagner Sept. 15, 2018, 5:04 p.m.
Top 25 college football roundup: Squally Canada, BYU stun No. 6 Wisconsin Sept. 15, 2018, 4:37 p.m.
Cleveland Browns releasing troubled wide receiver Josh Gordon Sept. 15, 2018, 8:21 p.m.
Jaguars try to end winless ways against Patriots’ Tom Brady Sept. 15, 2018, 8:08 p.m.
Former Colorado nuke site opens to public as wildlife refuge Sept. 15, 2018, 6:21 p.m.
MS-13 is suspected of killing her daughter. Now she is dead in a dispute over the memorial. Sept. 15, 2018, 5:45 p.m. Investigator: No evidence Boston-area gas explosions intentional Sept. 15, 2018, 2:52 p.m.
Sheriff: U.S. Border Patrol agent suspected of killing 4 women Sept. 15, 2018, 2:13 p.m.
Police: Man dies after shark attack off Cape Cod Sept. 15, 2018, 2:09 p.m.
Niece: Family won’t take in Elizabeth Smart’s kidnapper Sept. 15, 2018, 12:28 p.m. Experts disagree on whether Dallas officer could be credible Sept. 15, 2018, 11:28 a.m. Fearsome new stage begins as Florence floods inland rivers Sept. 15, 2018, 10:49 a.m.
Paul Manafort plea deal raises key question: What does he know? Sept. 15, 2018, 10:45 a.m.
MLS Capsules: Zlatan Ibrahimovic scores 500th worldwide goal; Galaxy fall Sept. 15, 2018, 10:43 p.m.
Ross Chastain earns 1st Xfinity win, holding off Justin Allgaier Sept. 15, 2018, 7:17 p.m.
On again? Floyd Mayweather says he and Manny Pacquiao will fight Sept. 15, 2018, 5:57 p.m.
Scott McCarron shoots 63 for share of Warwick Hills lead Sept. 15, 2018, 4:49 p.m.
Amy Olson takes 2-shot lead after 3rd round of Evian major Sept. 15, 2018, 4:42 p.m. The Spokesman-Review’s high school outdoor writing contest is accepting submissions Sept. 15, 2018, 4:14 p.m. Updated smartphone app allows public to report invasive species in Washington Sept. 15, 2018, 5 a.m.
Mariners rally past Angels for 82nd victory, clinch winning season Sept. 15, 2018, 9:46 p.m.
Out of Right Field: Where do the Seattle Mariners go from here? Sept. 15, 2018, 8:32 p.m.
Seahawks will be shorthanded for Monday’s game with Bears Sept. 15, 2018, 4:24 p.m.
Sounders win 9th straight, beating Whitecaps 2-1 Sept. 15, 2018, 9:31 p.m. Body found in Spokane River Sept. 15, 2018, 3:36 p.m.
‘Last Lockdown’ statue unveiled in Spokane, one of 10 in cities around the country Sept. 15, 2018, 2:12 p.m.
Ethan McIndoe, Jack Finley score twice apiece as Spokane Chiefs wrap up preseason with win Sept. 15, 2018, 9:27 p.m.
Here’s how to watch – and everything else to know about – Monday’s Emmy Awards Sept. 15, 2018, 4:30 a.m.
No. 10 Washington shuts down Utah in 21-7 victory Sept. 15, 2018, 10:50 p.m.
No. 10 Washington opens Pac-12 play against tough Utah team Sept. 15, 2018, 5 a.m.
Travell Harris gives Washington State a boost with 100-yard kickoff return for touchdown Sept. 15, 2018, 11:19 p.m.
Peyton Pelluer briefly contemplated move to Alabama before deciding on return to Washington State Sept. 15, 2018, 11:03 p.m.
John Blanchette: Washington State has every reason to believe early-season momentum will carry into Pac-12 play Sept. 15, 2018, 10:28 p.m. Analysis: Washington State wins ninth straight at home, defeating Eastern Washington 59-24 behind dominant offensive performance Sept. 15, 2018, 10:24 p.m. Difference makers: James Williams scores a trio of touchdowns in Washington State’s blowout win Sept. 15, 2018, 9:07 p.m.
TV Take: Washington State provided plenty of highlights for Pac-12 Networks to replay in 59-24 win over Eastern Washington Sept. 15, 2018, 8:35 p.m.
Sellout crowd on hand for regional battle between Washington State, Eastern Washington Sept. 15, 2018, 6:41 p.m.
Recap and highlights: Washington State Cougars fire on all cylinders in 59-24 victory over Eastern Washington Eagles Sept. 15, 2018, 6 a.m. The picks: Washington State will remain unbeaten after Eastern Washington test Sept. 15, 2018, 5 a.m. Some fans must choose between family, team ties as Washington State Cougars host Eastern Washington Eagles Sept. 15, 2018, 6:11 p.m.
Vancouver woman finds outlet to cope with mental illness Sept. 15, 2018, 12:16 p.m. Some of Washington’s biggest trees are mysteriously dying Sept. 15, 2018, 11:08 a.m. Pass defense, key rushing scores help Whitworth hold off Chapman to remain unbeaten Sept. 15, 2018, 7:14 p.m.
Whitworth closes out nonconference play with tough test against Chapman Sept. 15, 2018, 5 a.m.
Iranian Embassy in Paris damaged; Tehran knocks police work Sept. 15, 2018, 3:04 p.m.
Russian meddling abroad: Does Vladimir Putin pull all the strings? Sept. 15, 2018, 11:57 a.m.
Rwanda frees opposition leader, 2,100 others from prison Sept. 15, 2018, 11:40 a.m.
Typhoon kills 12 in Philippines, heads to southern China Sept. 15, 2018, 11:38 a.m. Envoy: U.S. willing to consider further lethal aid to Ukraine Sept. 15, 2018, 11:23 a.m.
Pope Francis pays tribute in Sicily to priest slain 25 years ago by Mafia Sept. 15, 2018, 11:18 a.m.